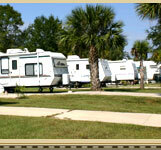 There are three distinct communities in our RV Resort. Each offering something a little different than the last. Between the three sections you will be able to find what suits your needs. Village Park, the original section of the RV Park, has had many improvements. All lots include full hook ups for 50/30/20 Amps. The access roads are paved and perfect for bikes and golf carts. The individual lots are covered in lush grass with multiple options for finishing and landscaping their lot. There is a new pavilion centrally located in the Village Park. It features a screened gathering space perfect for relaxing. Town Park has been designed to accommodate park models and the more permanent lifestyle that is associated with owning a park model. All Town Park lots have full hook ups for 50/30 Amps as well as cable. The lots are better suited for add on features such as screened in rooms, pavilions, decks and storage sheds. The Town Club House is located in the Town Park neighborhood. The design of the club house reflects a naturally simple and modern style. The Town Club House offers showers and restroom facilities as well as air conditioned gathering space for small parties and game nights. Town Park also is the closest to the private fishing pond. Preserve Estates, located adjacent to the Cross Florida Greenway (state preservation land) and running along the Ocklawaha River, is the newest and most exclusive section of the Wilderness RV Resorts At Silver Springs Resort. The Preserve Estates has paved roads, lots and drive access designed to handle the unique requirements of the large motor coaches, luxury 5th wheel, and the trailers or vehicles they often trail behind. All lots have a minimum of 5000 square feet, with many lots in excess of 7000 square feet. ORAL REPRESENTATIONS CANNOT BE RELIED UPON AS CORRECTLY STATING THE REPRESENTATIONS OF THE DEVELOPER. REFER TO THE PROSPECTUS AND ITS EXHIBITS FOR CORRECT REPRESENTATIONS.